Husqvarna’s new FC 450 ROCKSTAR EDITION is a motorcycle built to perform at the highest level. Embracing the highly successful collaboration between Rockstar Energy and Husqvarna, this exciting new model will form the basis of the official Rockstar Energy Husqvarna Factory Racing machine competing in the 2018 AMA Supercross Championship. 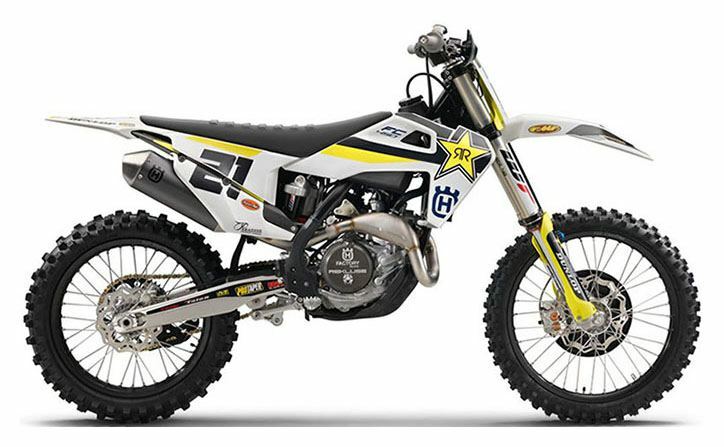 FUNCTIONAL BODYWORK: The FC 450 Rockstar Edition features fresh, new bodywork which clearly showcases Husqvarna Motorcycles pioneering design direction in offroad motorcycles. The ergonomics are specifically tailored to deliver greater comfort and control, enabling riders to perform at the highest level for extended periods of time. Wrapped tightly around the new airbox and lower radiators, the rider contact points have been slimmed down making movement between riding positions increasingly seamless while the new seat line and high grip seat cover deliver superior comfort and control in all conditions. WP AER 48 SUSPENSION: The 48 mm split air fork features a capsuled air spring and pressurized oil chamber for progressive and consistent damping. Damping is easily adjusted via the single air pressure valve for pre-load (on the left leg) as well as easy access clickers adjusting damping with 30 clicks (on the right leg). Additionally, the air pump needed to adjust the air pressure in the fork is provided as standard. Standard on the FC 450 Rockstar edition, the mechanical holeshot device compresses the front forks and minimalizes front wheel lift off the start. PRO TAPER HANDLEBAR: The Pro Taper handlebar is second to none for function and style. Manufactured to exacting standards, the Pro Taper handlebar features class-leading fatigue resistance at a minimal weight. A new handlebar bend further increases comfort by improving the pressure point on the riders hands, while the standard handguards offer maximum roost protection. SWINGARM: The hollow, cast aluminium swingarm is designed to offer optimal stiffness and reliability at the lowest possible weight. The chain adjustment range has increased by 5 mm extending the total wheelbase range for improved straight line stability on rough tracks and whoops. MAP SWITCH: Optimised for easy operation, the map switch selects between two engine maps, operates launch control and activates a traction control feature. Traction control works by analysing throttle input from the rider and the rate at which the rpm increases. If the rpm increases too quickly, the system will register a loss of grip and reduce the amount of power to the rear wheel ensuring maximum traction. 44 MM THROTTLE BODY: The FC 450 features a 44 mm Keihin throttle body. The injector is positioned to ensure the most efficient flow into the combustion chamber while to ensure optimal throttle response the throttle cable is mounted directly without a throttle linkage providing more immediate throttle response and feeling. Actuated via premium ODI grips and adjustable throttle assembly, new throttle cable feautures a new routing which eases maintenance allowing the cable to be removed more seamlessly. ELECTRIC START AND LI-ION BATTERY: Along with the benefit of an easy electric starting the system, a new generation Li-Ion 2.0 Ah battery is fitted to the FC 450. The Li-Ion battery weighs approx. 1 kg less than a conventional lead battery meaning the convenience of electric starting is delivered while keeping overall weight to a minimum. CNC MACHINED TRIPLE CLAMPS: The 22 mm offset CNC machined aluminium triple clamps feature an integrated rubber damping system that reduces vibration and increases rider comfort. Due to the increased longitudinal rigidity of the main frame, the upper triple clamp is now stiffer. A 3-way handlebar adjustment is standard and allows for customisable ergonomics. DDS CLUTCH: The FC 450 features a DDS (Dampened Diaphragm Steel) clutch. The exclusive characteristics of this system include a single diaphragm steel pressure plate instead of traditional coil springs. It integrates a damping system for better traction and durability. The billet clutch cover is 1:1 the same used by the Husqvarna Factory Racing team and delivers that unmistakable factory look while also being very lightweight and robust. CYLINDER HEAD: The new SOHC cylinder head is now even more compact while being 15 mm lower and 500 g lighter. As a result of the more compact design, the camshaft is now closer to the center of gravity significantly improving handling while shorter valve timing improves bottom end performance and responsiveness. The new camshaft features an improved cam surface and actuates four lightweight titanium valves. EXHAUST SYSTEM: The exhaust system is expertly designed to deliver leading performance. The header pipe features a new flow designed resonance chamber that integrates into the header pipe and also features a new joining junction allowing it to be removed without removing additional parts. The new silencer is shorter and more compact while delivering the same damping volume and noise level. The unit is crafted from lightweight aluminum and is stylishly finished off in a new coating and proudly carries the legendary Husqvarna logo. LIGHTWEIGHT FRAME: The hydro-formed, laser-cut and robot-welded frame is expertly crafted by WP Performance Systems. Constructed to harness specifically calculated parameters of longitudinal and torsional flex, the frame features an increase in longitudinal rigidity resulting in improved rider feedback, energy absorption and stability. The frame is finished off in a premium black powder coating with a carbon fiber reinforced engine protector and standard frame protectors guaranteeing superior protection and durability. CARBON FIBRE SUBFRAME: The composite subframe is a design unique to Husqvarna showcasing pioneering technologies and innovation. Using 70% polyamide and 30% carbon fibre, the new 2 piece subframe saves 250 g weighing in at just over 1 kg. Apart from being remarkably robust, specific care is taken to deliver the perfect rigidity for optimal handling and rider comfort. Front Rims - 1.6 x 21 in.